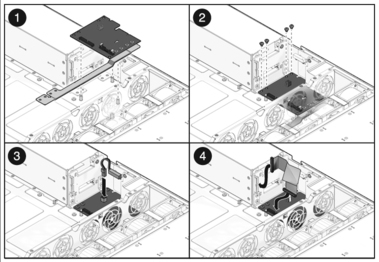 Lower the power distribution board/bus bar assembly into the chassis. The power distribution board fits over a set of mushroom standoffs in the floor of the chassis. 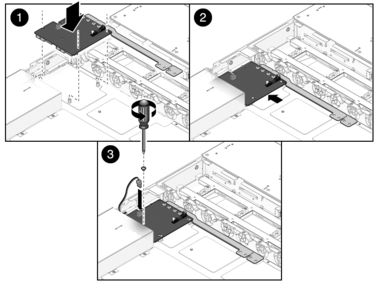 Slide the power distribution board/bus bar assembly to the right, until it plugs into the paddle card. Install the No. 2 Phillips screw to secure the power distribution board to the chassis. (Sun SPARC Enterprise T5220 server) Attach the four No. 2 Phillips screws securing the power distribution board to the power supply backplane. 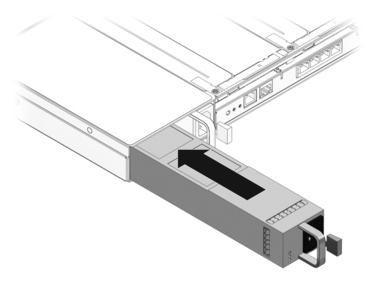 (Sun SPARC Enterprise T5220 server) Connect the power supply backplane ribbon cable to its plug on the power distribution board. Connect the top cover interlock cable to the power distribution board. (Sun SPARC Enterprise T5120 server) Install the power supplies. See Install the Motherboard Assembly.. Note - After replacing the power distribution board and powering on the system, you must run the ALOM CMT setcsn and setcpn commands to set the electronically readable chassis serial number and server part number. At the ALOM CMT command line interface, use the setcsn command to set the chassis serial number and the setcpn command to set the server part number on the power distribution board. The following is an example of the command-line dialog used to set the chassis serial number and server part number for a Sun SPARC Enterprise T5120 server. Caution - When performing the following steps, use special care to enter the correct numbers. Once the power distribution board has been programmed with a chassis serial number or server part number, the number cannot be changed. setcsn: Chassis serial number recorded. setcpn: Chassis part number recorded.